This Interesting Sword Has Been Sold. Thank you! Blade 18 3/4" L x 1 3/4" W x 1/4" T at widest LOA 23 3/4"
Presented is a nicely made short sword with no fuller on the blade, and with a prominent C on one end of the cross guard and an S on the other. This marking appears on both sides of the cross guard. There is no star on the pommel. 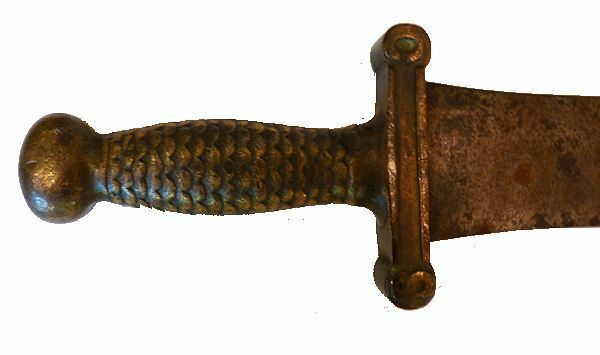 We sold a sword like this with the CS STAR marking on both sides which had a crudely made grip, and a single fuller on the blade which we are sure was a reproduction of a rare and very valuable sword that sells for over $12000.00. This one, we are not so sure is a copy. Like the more expensive authenticated sword, it is has no maker's mark, and there is no scabbard. 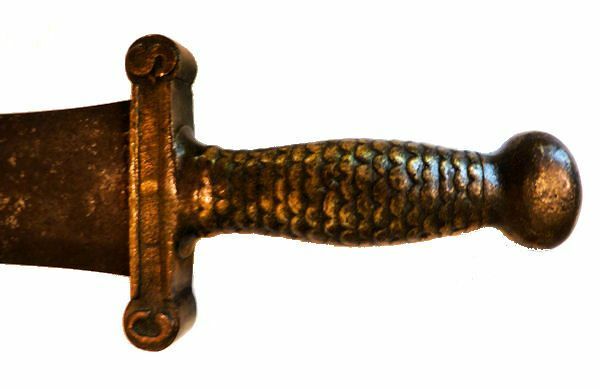 But the hilt is nicely made of fish scales like the Ames 1932 short sword which they all replicate. The sword was purchased at auction without provenance, and nothing else is known about its history. If it is a copy, then it is a well made one, but we have priced it as if it were a reproduction. It also comes with our "No questions asked guarntee of satisfaction." The scarcity of the real swords of this design makes this a worthwhile addition to those that fancy Confederate Civil War relics, but can't afford them. For example, there are two swords of the style with the CS - Star markings on the internet. One is priced at $12,500.00 and the other at $9500.00. 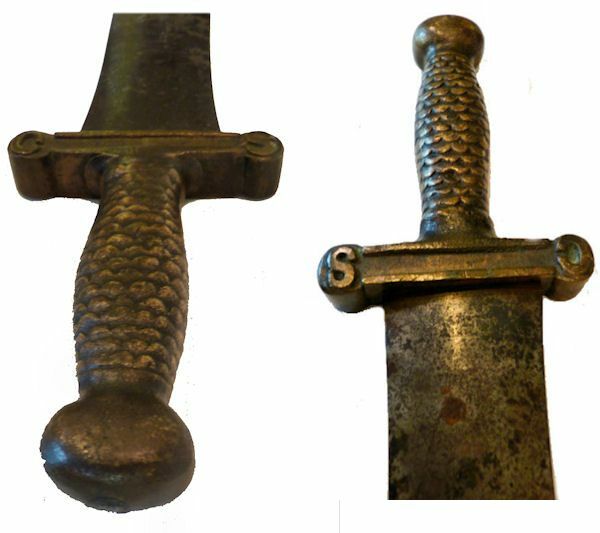 This sword design was first made by Ames as the Model 1832 and issued to regular artillery regiments and infantry. The Ames short sword appeared in their catalog as Number 350. DIMENSIONS: The blade is 1 /4" wide at the hilt and 19" long. There no "fuller". The hilt is 4 3/4" long, 1 1/4 wide and /4" thick. The entire hilt is cast brass, and the design is molded with fish scale decoration. The cross guard straight cross and there are no quillions. CONDITION: The blade has some slight pitting and dark areas of rust with with some of its original nickel plating in evidence on both sides. Both edges are sharp and without nicks. The blade is solid in its handle. Confederate swords are scarce and should appeal to the most sophisticated collector who desires the most unusual.